The account lockout tool provides real-time details on reasons for Domain account lockouts. The native Windows Active Directory Account lockout policy is a practical method to counter password guessing attempts which are successive, time-bound, logon pursuit that result in a locked account due to a bad password. Other reason for an account lockout might be due to strict password setting with a frequent password-reset cycle resulting in a hard to remember password. 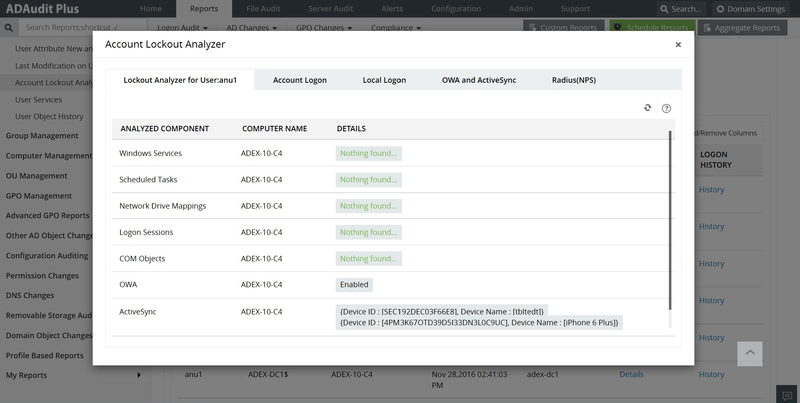 ADAudit Plus helps you track Account lockouts in Windows Active Directory, Windows Servers and Windows Workstations with querying the collective data from the 'user' account event log data and formulating the complex information and presenting as simple, GUI pre-configured reports and instant email alerts. Account Lockout Analyzer now seaches for mobile phone logins(ActiveSync), Outlook Web Access(OWA) also. Counter critical business applications from malfunctioning due to an account lockout of a user / service account with timely email alerts from ADAudit Plus, for an immediate solution. 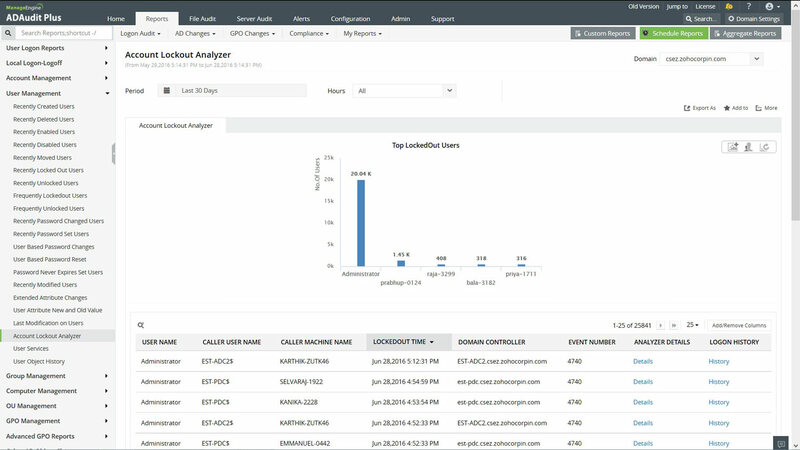 Meet Compliance requirements from SOX, PCI-DSS, FISMA, HIPAA, GLBA... To maintain an audit trail of the locked out accounts, user password resets, password changed users and audit many more AD objects with ADAudit Plus. Monitor activities by Admin, Helpdesk, HR etc. Also, provide a 'reports view only' login for IT Auditors. Single view of all critical audit data for configured domains. Set email alerts for account lockouts, unauthorized access. Archive AD event data for Security and Forensics with reports in XLS, CSV, PDF and HTML formats. Know the reason behind a user / service account lockout. Select the filter attributes and acquire the detailed information for a crisp event reporting. ADAudit Plus is a web based real-time Windows Active Directory & Windows Servers Change Reporting Software that audits-tracks-reports on Windows Active Directory, Windows Workstations Logon / Logoff, Windows File Servers & Member Servers to help meet the most-needed security, audit and compliance demands. Track authorized / unauthorized access of users Logon / Logoff, GPO, Groups, Computer, OU, DNS server changes with 200+ detailed event specific reports and real-time email alerts. Also, export the results to xls, html, pdf and csv formats to assist in interpretation and computer forensics! Account Lockout Analyzer is available only in the Professional Edition.